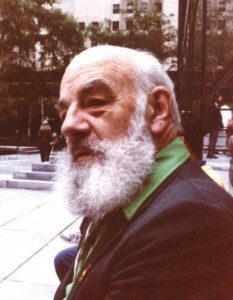 Art Widner at the 1990 Worldcon. Photo taken and (c) by Andrew Porter. By Marty Cantor: This is going on a few lists where there may be some fen who remember this Art Widner board game. Right, you read the name up above correctly — Art Widner. 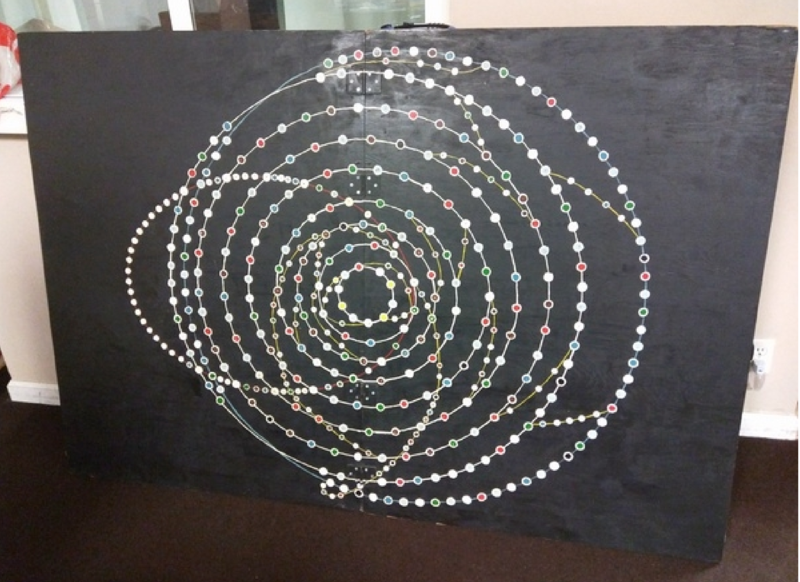 Interplanetary is a board game which Art Widner invented in 1943. From paperwork (which I cannot now find) I believe that there may very well have been several boards many decades ago but I am certain of one board which is still in existence, the board I used when I played the game last night. Some time after I joined LASFS in 1975 I discovered that LASFS had not only a board for this game but also various playing pieces. And paperwork showing that others had made attempts to make the game more playable than what was apparently earlier versions of the game. Ted Johnstone, Bill Ellern and Betty Knight demonstrating Interplanetary at the Los Angeles Hobby Show in 1960. As a seasoned board game player I soon found that the game seemed to need quite a bit of work to make it fully playable and I worked on the game, off and on, for several years. This work required the cooperation of other LASFS’ game players. Finally, in 2007, after many years of not paying attention to the game, I put what I consider to be the finishing touches on the game – and then again put the game aside for about 10 years. A couple of weeks ago I i/n/v/e/i/g/l/e/d/ convinced three women who were new to the Friday Night Board Gaming Meetup I run to play a Eurogame called Wars of the Roses. This is a longish game of some intricacy. They loved the game so I thought I would introduce them to Interplanetary so I printed the rules and handed them out. Last night 4 of us played Interplanetary. It is, obviously, not a Eurogame-style game, depending as it does on the rolling of dice. Interplanetary is, though, a game with some strategy and a spectacularly different board than any other game. Corflu 34 will be hosted in the Los Angeles area in 2017. The bid was accepted today at Corflu 33 in Chicago. Marty Cantor is Chairman, Milt Stevens will organize programming, Elayne Pelz is Treasurer, Membership, and Hotel Liaison, and Rob Jackson is the UK representative. The con will be held April 29-30, 2017 at the Warner Center Marriott Hotel in Woodland Hills. By John Hertz: John DeChancie corrected me. I reported that at Loscon XXXVIII, where he was Author and I was Fan Guest of Honor, he said he’d never heard of fanzines until Marty Cantor sent him Holier Than Thou. This was a misstatement by one or both of us. In fact DeChancie knew of fanzines; he was then given a stack by no less than Bob Leman; he wrote Thou a letter of comment; the return copy was the first specifically addressed to him. I like this version better, not only because it’s truer, and shows a fine fannish pro hipper sooner, but also because it shows him looking around. Be bigger than your immediate adventure. Reporting on the new LASFS (Los Angeles S-F Society) clubhouse I said it had no patio. Other members later pointed out a door I hadn’t seen. It opened onto the 14th Chorp Dimension and there I was. 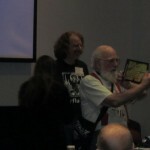 Elst Weinstein declared to me at Loscon, “I’ve been on TV more than anybody at this convention!” David Brin might have been nearby so I suggested that was hard to believe. Once I heard his story, however, I was convinced. Elst appeared in an April episode of Storage Wars as an expert helping to identify a strange old medical device. Storage units rarely figure prominently in fannish news – really, the last time was 1994 when Marty Cantor was working as the manager of a U-Haul facility and auctioned off an unclaimed locker in which the winning bidder found several decomposing corpses. Eventually the original renter was tracked to Jakarta and arrested for murder. Storage Wars follows four bidders competing to score big at storage auctions. In “Live and Let Bid,” episode 19 of the show’s first season, someone found a peculiar old brass mechanism and turned for help in identifying it to The Southern California Medical Museum. Elst, a pediatrician, also is an avid collector and happens to be the museum’s volunteer curator. He knew the item on sight. It was scarifier, probably dating to the 19th century and used by a doctor to bleed patients. Not long ago Elst’s museum mounted an extensive exhibit about medical bleeding, full of fleems, scarifiers, glass cups and leeches. Elst was on screen for about two minutes. But A&E has repeated the episode over 100 times since April. As a result, he’s enjoyed many times his allotted 15 minutes of fame. A local paper subsequently published a fine interview with Elst about the Southern California Medical Museum. Click here to read it. The Los Angeles Science Fantasy Society held the grand opening of its new clubhouse in Van Nuys on September 1. I went early to scout out the parking, and reached the clubhouse around 6 p.m., in time to greet Karl Lembke and Christian McGuire on my way. I paid my dues to treasurer Elayne Pelz and followed registrar Michelle Pincus on a guided tour of the new place. The clubhouse occupies a block-long commercial building formerly divided between several businesses. In the new configuration there is a large meeting area with an enclosed office to one side, a spacious socializing area, and a big section for the club library. There are other substantial nooks and crannies that will be used for storage or to place things like the soda machine where they won’t be in the way. And there’s a full kitchen. LASFS held a potluck dinner, and Eylat Poliner did heroic labor on the set-up. Fans brought cuisine from four continents and Brooklyn (George Mulligan explained at length that corned beef and cabbage is not a native Irish dish). Marc Schirmeister’s donation got the biggest reaction – an ice chest full of rare and exotic soft drinks from Galco’s Soda Pop Stop in Highland Park, CA. There was Moxie, Old Rhode Island Molasses Root Beer, A.J. Stephens Raspberry-Lime Rickey, Leninade, Fukola Cola, Spruce Beer and Kickapoo Joy Juice. “You should see what I didn’t buy,” laughed Marc. 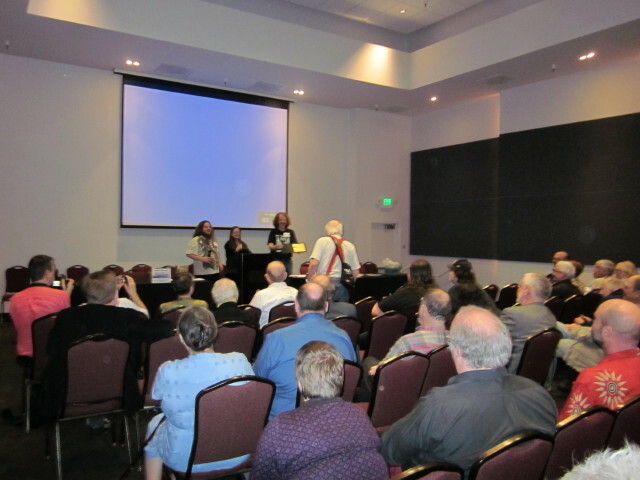 Long-time members present included June Moffatt, Barbara Harmon, Don Fitch, Bill and Jane Ellern, Larry Niven, and Jerry Pournelle. Other members nearer my own vintage included Marty Cantor, Lee and Barry Gold, John Hertz, Sandy Cohen, Selina Phanara, Matthew Tepper, Mike Stern, Lucy Stern, Charles Lee Jackson II, Regina and Greg Reynante, Gavin Claypool, Genny Dazzo, Craig Miller, Jim Daniels, Tom Safer, Doug Crepeau, Greg Barrett, John DeChancie, Mike Thorsen and Chris Marble. I also saw Tom Khamis, Sundance Bekinnie, Ed Hooper, Wendy Wiseman, Arlene Satin, Janice Olson, Nick Young, Maryann Canfield, Darnell Coleman, and about 25 more whose names I don’t know. At 8 p.m. there was a surge toward the meeting room. Marcia Zeff called things to order. Karl Lembke took his post as secretary. I had made a strategic choice to stay in the socializing area during the potluck rather than stake out a seat at the front of the meeting (without which I couldn’t hear what was going on), so I didn’t stay through the formal part of the meeting. The main drawback of the new place is the minimal parking available in the immediate neighborhood – Arlene Satin told me there are 17 spaces. Curbside parking on Aetna to the west is problematic because city signs forbid it between 9 p.m. and morning – no problem if you’re willing to leave the meeting early. Halfway up the same block is an entrance to a vast Metro park-’n-ride lot – where signs threaten those who aren’t transit customers that their cars will be towed. I expect, in the era of ubiquitous surveillance cameras, it wouldn’t take long for somebody to notice a bunch of people leaving their cars at the far end of the lot then walking away from the bus depot. However, these may not be insurmountable problems and the club will try to work with the city for change. Inside it’s certainly a nice space for the club’s needs and I’m looking forward to seeing it again once they’re fully moved in. 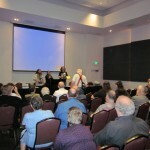 Marty Cantor: “This particular photo was taken just as the meeting was about to get under underway and I was standing just to the west of the podium, looking to the back of the room which is the entryway to the socializing area and the library.” Front row (L toR): June Moffatt (in blue blouse), Barbara Harmon, Lee Gold (back to camera). 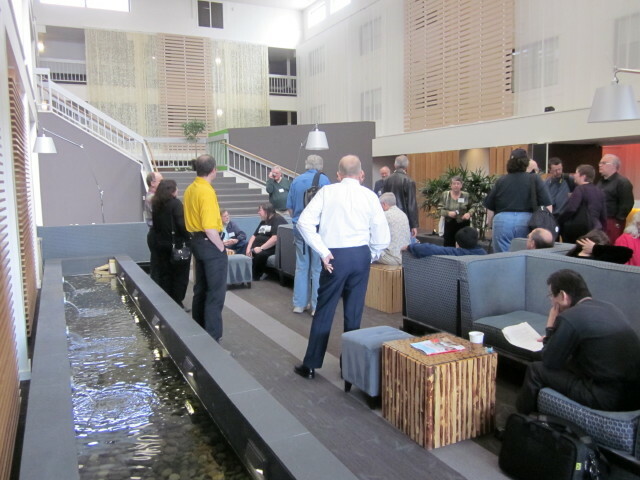 Marty Cantor: “This is a photo from the entrance of the meeting room to the socializing area. This was taken before the area got packed with people.” Barry Gold (foreground, in gray); just past Barry’s head, Mike Glyer (in burgundy); in center, John Hertz talking to Genny Dazzo; behind John on left, Sandy Cohen. Los Angeles Science Fantasy Society members voted at the club’s April 21 meeting to ratify its directors’ decision to sell the current North Hollywood clubhouse and buy another building in Van Nuys. The club has been at the North Hollywood location since 1977. 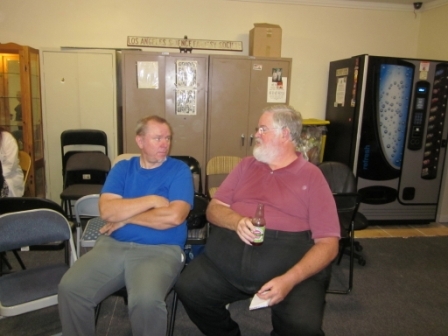 Last night’s meeting was not the first that the other members knew of our sale of the clubhouse. The Board had been consulting with the members about selling the clubhouse since before it happened. Indeed, when the realtor came to us and told us he had a buyer for our clubhouse, we told the members this was happening and that we were negotiating for the best price we could get. And they knew that the clubhouse had been sold — and the conditions where it might not be sold if we did not get a new place — way back in September when it was all happening. In September of 2010, a real estate agent approached the club and said that he had an offer to purchase the building. We did some dickering and we arrived at a price we would accept for our property. There were some conditions we wanted and the buyer accepted it. Firstly, the prime condition of the sale was that it would go through only if the LASFS could find a building we could buy. Secondly, after we purchased our new building and escrow was completed on both places, the LASFS would have three months to move from our current clubhouse. These were the most important points of our agreement. The real estate agent, after finding out our requirements, did a fine job of finding places which were candidates for purchase. Most of these places, though, pre-screened by Elayne Pelz, had one or another deal killers. Several months ago our Board of Directors inspected a prospective clubhouse and liked it well enough to make an offer on it. We were unable to come to terms with the owner and we kept looking. This past Sunday, April 17, 8 members of the Board of Directors met at another prospective clubhouse, inspected it, and decided that it would meet most of the requirements of a new clubhouse. We made an offer on the building, it was accepted, and the initial paper was signed. We have 15 days to back out of the deal (with no penalty) if we decide we have to. Next Tuesday we will have a technical inspection of the building and this will tell us if there are major construction problems with it. In the meantime, the Board requested the club Procedural President to schedule a special programme at the regular April 21 meeting. 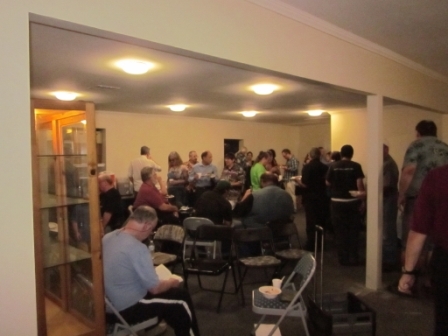 At this meeting the Board presented to the club members present what was occurring. Below is a précis of this part of the meeting. 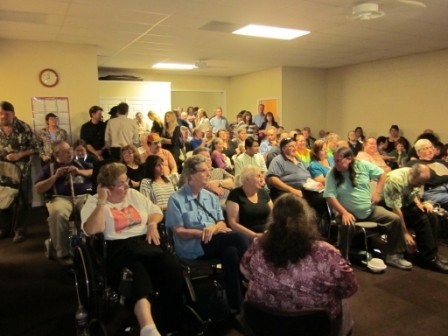 The meeting room had standing room only as a lot of members showed up to see our plans. Elayne had some very large blow-up photographs which were displayed in various parts of the room. I had some 8 12 x 11 photographs I put on the Treasurer’s desk and set up my laptop on the food table with a continuing slide-show of the 31 photos I took of our new clubhouse, and the CD of my photos was put into Rob’s computer and selected shots were shown on the large television screen. Before the meeting started, various board members answered many questions from the members; and, after the meeting started, when we got to new business, Christian McGuire got up, made a few opening remarks, and then turned to a question and answer session where many good and penetrating questions were answered by the appropriate Board members. Elayne Pelz mentioned that there was another person interested in this new building, so she made an offer of $525,000 for the building, the offer was accepted, and she signed the agreement. We can back out any time up to 15 days from today. In response to a question, Elayne mentioned that our current building was sold for the same price but the Real Estate agent’s cut and other fees will bring us down to $490,000. But we do have money in the Century Fund and there is enough to pay cash with no money-eating interest rate (e.g., no mortgage) and still have money for the initial remodeling work. After awhile, when it began to appear that we were going over the same ground, member Ed Green moved (and was seconded) that the members accede to the actions of the Board and that the Board keep the members apprised of developments. This motion was passed, unanimously. We have purchased a new building. The new building is at the intersection of Aetna and Tyrone in Van Nuys, a block in either direction from the major streets of Van Nuys Blvd. and Oxnard. It’s within walking distance of the Van Nuys station on the Metro Orange Line bus route. We outgrew the current clubhouse many years ago — it is just too small. Plus, it is really falling apart and repairs are getting more and more expensive. I think that the size of our current buildings is a bit above 2100 sq. ft. — the new building is 4400 sq. ft. And is in much better shape than our current place. Many of our library books are in off-site storage: our new library will be about twice the size of what we now have. Several of Marty’s photos of the new place are here. And several dozen photos Karl Lembke took during the directors’ inspection are here. Proposed floor plan of new LASFS clubhouse. The backsides of great fanzine fans. A rare view, rather like that famous photo of Churchill. For a hot-house plant like me, even Los Angeles can be cold in February. But a sweater, jacket, overcoat, gloves, and a hat can take care of that whilst the interior of the car warms up. Even over the Grapevine, that gateway to a fast drive on the I-5 north from Los Angeles to the Bay Area. Or, to be more accurate, to Sunnyvale, in the heart of Silicon Valley. Even in Buttonwillow, 100 miles north of my North Hollywood starting point, where I stopped to put gas into my car, and thence to grab a bite to eat in the rest stop just north of that burg, the cold was barely tolerable when I removed my gloves to remove money from my wallet to pay for the fuel at the gas station and to hold the sandwich I consumed at the rest stop. But what really warmed me up was the listening to some of my favourite music on my way north. CD players built into automobiles are a boon for people like me, people who like music at least a bit out of the mainstream. See, I started out listening to two CDs of the secular music from the Renaissance, wonderful sounds from 400+ years in the past. I then moved up 200 years and listened to a CD of Ludwig von Beethoven’s overtures – and then got all modern listening to Catulli Carmina and Trionfo Di Afrodite by Carl Orff, modern music only 100 years old. I was listening to Orff’s Carmina Burana when I pulled into the parking lot of the Domain Hotel in Sunnyvale, the venue for this year’s Corflu, a con celebrating a part of science fiction fandom which started in the 1930s and sometimes feels like it has barely left that time despite the embrace of modern zine-creating technology. And almost the first thing I did after registering at the hotel and moving things to my room was to take three other con-goers in my car and drive to the Winchester Mystery House for a tour of same. This weird and wonderful 160-room, Victorian mansion which was continuously a-building for 38 years (until the owner died) seemed a fitting start to a con dedicated to the ideals of what started our hobby. (Unfortunately, we were not allowed to take photographs of any parts of the interiors of the mansion but photos aimed outward from porches and balconies were apparently not forbidden – and I shot some from those viewpoints.) Fandom does, of course, adapt to the new technology to continue producing fanzines, usually much easier to create than it was in bygone days; and, sometimes even showing better repro and other technical niceties. This Corflu’s concom, though, tech-savvy as they were, did not keep their web site updated, so it was a decided shock to see some people show up who were not listed as members. Make that a “pleasant shock” in many cases, as non-listed Pat Virzi walked into the hotel lobby, and the totally unexpected appearance, walking down a hotel corridor, of Victor Gonzalez (with his wife, Tamara). Out of the past walked Gary Farber – or so it seemed at the time as I do not think that I had seen Gary since the 1984 Worldcon in Los Angeles. And, even though the day before I had been posting on an e-list where Graham Charnock was sending messages from London, England, awaiting the birth of his first grandchild, there he was in the hotel bar when I walked in. One new person I met was Kat Templeton. On one or another of the e-lists I infest it had been mentioned that she was going to be producing a fanzine. I asked her about it and she told me it was half-finished. As, maybe, a spur to get her to do more fanzining, I handed her an envelope of Rotsler illos. I had used all of these illos during 2010 and I was originally going to give these to Earl Kemp for use in his on-line zine. But, with Earl not at the con this year, I saw no reason why I should not help a relative newcomer by giving her the Rotsler illos. And one of those wonderful, unplanned happenings of cons are the totally unexpected connexions and meetings which spontaneously happen. I more or less slightly overslept on Saturday morning – but I was still the first person down for breakfast. I had just finished eating and was starting my second cup of coffee when Michael Dobson walked in and joined me. He told some interesting anecdotes about some people (non-fans) he knew in DC (where he lives) and we traded some anecdotes about Australia, a place we had both visited. At the time, I had been planning to take my second cup of coffee and walk up to my room and begin typing this con report on my computer, but it was really more interesting, talking to Michael, so I started working on this account about an hour later than planned. As cons are one of those things which are usually so interesting there is relatively no time during them to do any writing, the only time for typing is either before or just after breakfast for an early riser like me. As is the protocol at cons, at least for those of us who have been in fandom for awhile and who have attended some cons, almost more important than the usual official starting ceremonies are the individual greetings of those whom one has not seen since the last iteration of the con – especially at Corflus as this meeting of fanzine fans is often the only con attended by those of us who enjoy this part of fandom. Of particular enjoyment are the first meeting with fans with whom one has been corresponding in one or another milieu, often for some time, but with whom this is the first ever face-to-face meeting. such was the case in my meeting with Mike and Pat Meara, over from Old Blighty to experience the American iteration of Corflu and to see how it differs – if at all – from the English version of the con which they attended the previous year. Indeed, I met them almost as soon as I arrived at the con hotel. And they (along with Milt Stevens, the other Angeleno at the con) were my passengers as I drove them to the Winchester Mystery House, theoretically a 10-minute drive from the hotel – according to the map I downloaded before I left North Hollywood – but local traffic made that more than a bit of a joke. But get there we did, and I must say that we all enjoyed the tour of a house with cabinet doors which opened to blank walls, an outside door on a higher floor which opened up to open air and no stairs, a stairway up to a ceiling, a window in the floor, and many other strange constructions. Anybody interested in this over-large anomaly of a building can probably read about it in many places. Needless to say, joining with the British Sandra Bond and the three passengers she drove over from the hotel, we had a fascinating tour of this architectural pile. After which we all returned to the hotel or went for a meal or did something before we went to the Opening Ceremonies. In my case, even though Milt and I shared a table in the hotel restaurant before going to the opening ceremonies, nothing much which happened on that Friday evening compared to the sensory overload of viewing the Winchester House. At the Opening Ceremonies I remember Carrie Root’s name being pulled from the box, therefore making her the Guest of Honour at this Corflu, but not all that much of what else happened at that event – except me making an announcement of the Len Moffatt autobiography which I had printed upon hearing of Len’s death. (This autobiography was a compilation of 9 episodes which Len wrote and which I had originally pubbed in nine different issues of my zine, NO AWARD (starting over 10 years ago). Tired from all of this, I went to bed even earlier than usual. So, if anybody is interested in what I did at the room parties and such like at the con, please note that I am an early riser and rarely stay up until midnight at most cons. Indeed, even were I to stay up past midnight, I would be asleep anyway. A night person I am not – unless it is at the tail end of the night, as I awaken before sunup. Programming at Corflus is always single track. Granted, there are not all that many people at these cons compared to, say, Worldcons, but these are all the sort of people with whom other fanzine fans love to hang around. And talk. And talk. And talk. So, even though whatever the programming at the con happens to be, tailored as it all is to the interests of fanzine fans, sometimes many of the attendees do not much bother the programming which is put on for their enjoyment/edification. This means that I missed the fannish trivia contest where four teams squared off to see which team knew the most useless information. The results, though: the Mike McInerny American team of John D Berry, Milt Stevens, and Gary Farber beat the Sandra Bond English team. In my case, I was only interested in the Fanzine Auction, put on at 8 on Saturday evening, given that I had brought items to auction off for DUFF. All of the items put up for bid at Corflu auctions are meant only for the support of various fannish charities, usually (and mostly) the various travel funds: TAFF, DUFF, GUFF, and the like. I have participated in fannish auctions before – as an auctioneer – and it turned out that this was to be no exception as Chris Garcia, the con chair, had not made arrangements for anybody else other than him to do the auctioning. As more and more fans straggled in from dinner, the auctioning got more spirited as more people began participating in the bidding. At the end of the scheduled hour, with only a few items left to auction, we called an end to the bidding so that those who had won items could pay for them and the next programme item could commence. This was a fannish play, written by Andy Hooper. I always seem to enjoy reading them after the fact as I usually have conversations drag me away from the live productions – and this time was no different from the usual. 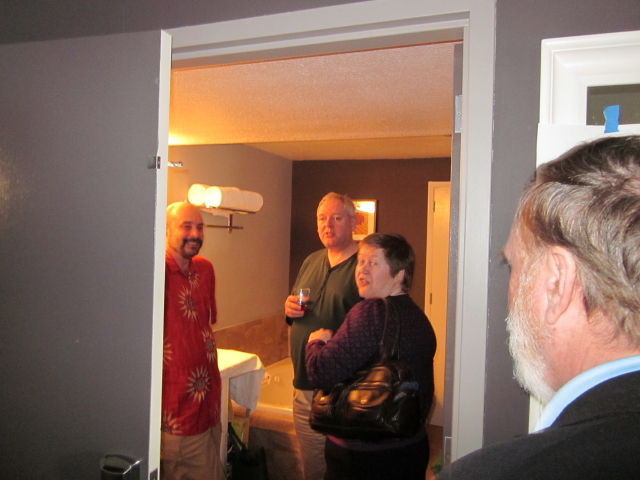 I went up to the con suite and got into some conversations, including a bit on the virtual con suite, a connexion to interested parties via the internet. This was most ably handled at the Corflu end by Kat Templeton. Sunday morning saw Jack Calvert arriving for breakfast as I was going in for same. Yeah, I slightly overslept today, too. Jack is a member of LASFAPA, one of the two APAs I run, and he is also a member of Inthebar, the e-list founded by fan artist Harry Bell. As is all too common, I remember that Jack and I had a fine talk during breakfast, with me not remembering any of the details. The food part of the Banquet was served in a room off the lobby of the hotel. So, when we finished our meal we moved to the room we used for Corflu functions, on a hallway in back of the elevators on the second floor. This is where the “business” of the con was then held. Starting with the nominations and voting for the Past President of FWA, Fanzine Writers of America. As explained by Ted White (who ran this part of the meeting), what the members of the con produce are fanzines, and whether drawn or typed, we are all writers, and no matter from whence we came, we are all Americans – at least for the purpose of FWA. And we always vote for last year’s President as there is never any current President of FWA. (Ted explained all this better than me but I was too busy taking photographs to write down any details.) Anyway, after some very spirited voting, Spike was voted Past President of FWA. Carrie Root then gave her Guest of Honor speech; which, in her case, was a slide show of a visit with relatives and Andy Hooper to northern New Mexico. It was well received. There was then a discussion of where Corflu would be held in 2012, with Ted White presenting a bid for Las Vegas as none of the Vegrants were able to appear at this year’s con. Many of us have good memories of the Corflus previously held in Vegas, so it was with good heart that Las Vegas was awarded the 2012 Corflu. The end of the Banquet is traditionally the end of the programming at Corflu. The Con Suite will remain open until around midnight or so and there are still get-togethers and fannish food expeditions afterwards, but many people leave for home on Sunday afternoon and evening. Being theoretically retired – well, I run the apartment building in which I live as a supplement to my Social Security check – I usually stay at the hotel an additional night and start my drive home early Monday morning. As I did, this time, except I had the “pleasure” of having rain or drizzle as an accompaniment to my driving all the way south until I arrived at the Grapevine. From the beginning of my ascent into the mountains – and for the remainder of the day – the Sun was shining brightly. A fitting end to a fine con. Art Widner rises to accept his Lifetime Achievement Award. 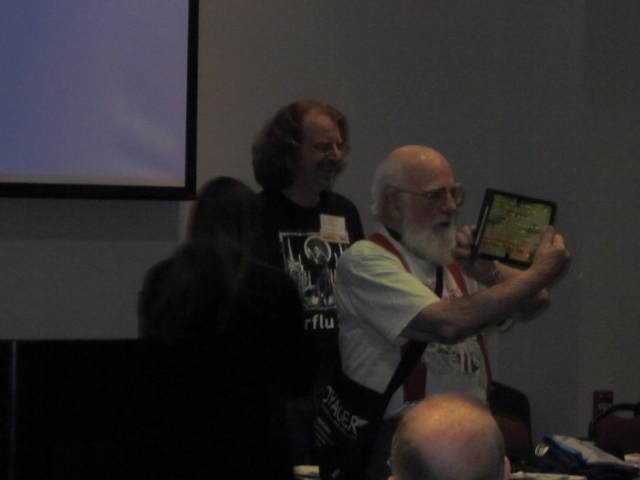 Art Widner deciphers his award plaque. Last weekend at Lunacon the fans caught in a similar predicament made a higher quality decision. Michael Walsh notes “So This Is Your First Con,” Friday at 4 p.m., had Ben Yalow and three other fans slated to participate. Only Ben showed, while Perianne Lurie was added at the last minute. There was an audience of one: Filthy Pierre Strauss, who probably went to his first con during the Kennedy administration. All decided that perhaps canceling would be best.